MIDLAND PARK – When 26-year-old Samantha Nerney tried heroin for the first time, it didn’t feel like she was playing with fire. The addictive nature of the drug escaped her. After years of struggling with drug and alcohol abuse that robbed her of adolescence and young adulthood, Nerney has now been clean and sober for eight months. 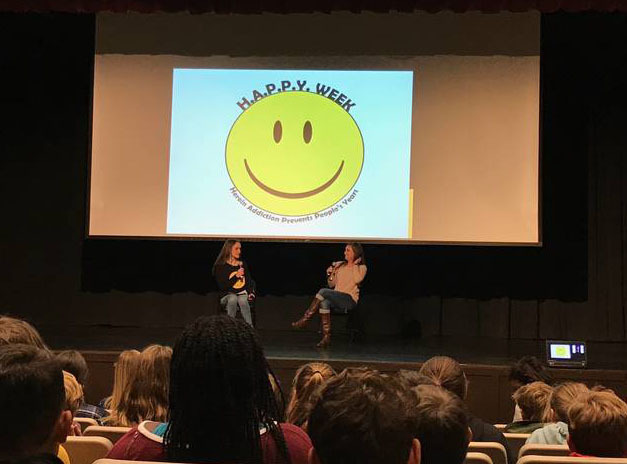 In the auditorium of Midland Park High School on Oct. 3, she sat down with 17-year-old Stephanie Reifman of Upper Saddle River on the auditorium stage telling her recovery story with a winsome smile during Reifman’s H.A.P.P.Y. program for the seventh and eighth-grade class. The program was part of a week of activities that kicked off Respect Week. Craig Rush, student assistance counselor at the junior-senior high school, said the program was age-appropriate. Middle school students are at an age to begin making decisions. The acronym stands for Heroin Addiction Prevents Peoples’ Years and involves an intimate conversation Reifman leads with recovering heroin addicts and people who have had loved ones touched by addiction. Reifman spearheaded the program after hearing her favorite actor, 31-year-old “Glee” star Cory Monteith’s untimely death in 2013 from a heroin addiction. Realizing the opioid issue in her own backyard and the amassing number of deaths from the substance each year, Reifman knew it was apropos to begin the program as a way to give back to students, hoping, she said, to affect and save a life.